Is social media a fad? or will it continue to grow! They key is the their attitude towards social networking. There has been great debate in the online circles regarding the privacy issues and the dangers of sharing information online. However for better or worse, those who are part of Generation Y tend to focus more on the social benefits of sharing personal information and personal communication. They are more than willing to trade their privacy for the social tools to communicate and share. 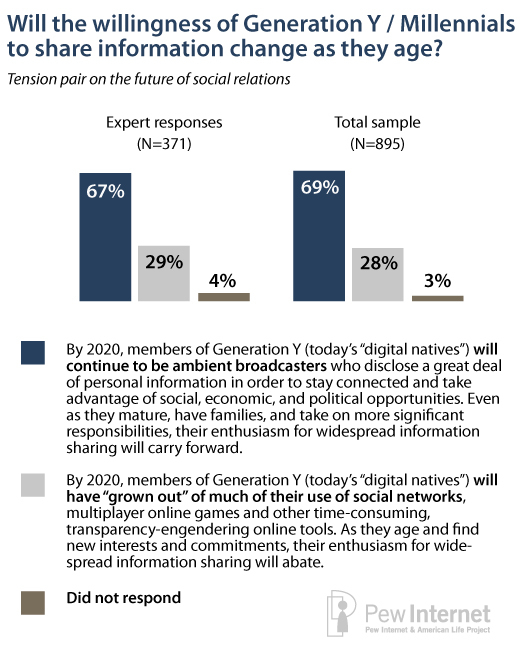 There are however almost 30% of the group that believed Generation Y will lose interest in social marketing over time. This survey was conducted as part of a greater study of the “Future of the Internet”. In a separate study by online gaming site Roiworld, 600 teens were were found to spend two hours a day online, 80% of whom spent time on a social network. The study showed there are signs of “Facebook Fatigue” as 1 in 5 were no longer visiting Facebook or using it significantly less than they did before. The teens cited losing interest or leaving because parents are there. A small segment mentioned privacy issues. Yet Facebook continues to be extremely popular among teens. 70% of teens use it in some form. Nearly 80% have a profile. Youtube ranks second at 64%, MySpace is at 41% and Twitter is 4th at 20%. The study also revealed part of the reason teens spend so much time on Facebook is to play Facebook games. Do you think Generation Y (the youth) will continue to use social networking as much as if not more as adults? Or do you think there will be “social networking fatigue” and social network usage will fall as they get older? If willing, state your AGE in your comment below so we know who the perspective is coming from! Answer the Social Media Ques above & Take some Polls! No way - Get on board bc it's only going to get bigger!